Eat Your City: Calgary Stampede 2012, Calgary Alberta - new food, jumbo smoked turkey legs, mini donuts, fried cheese... bring it on! Calgary Stampede 2012, Calgary Alberta - new food, jumbo smoked turkey legs, mini donuts, fried cheese... bring it on! Its that time of year again.. Calgary Stampede, this time its the 100th anniversary. Along with the rides, the chuckwagon races, and the games, there's the food!!! This year's new food items include battering up and deep frying: veges, pickle slices, wagon wheels, butter chicken sausage, and even deep fried koolaid! There's also pulled pork poutine, beef bacon sandwiches, jalapeno corndogs, cotton candy cupcakes, warm corn salad, Loukoumathes (think Greek timbits with nuts and honey) to compete with tummy space with favorites like mini donuts, jumbo smoked turkey legs, double smoked bacon and fried cheese making a come back from last year's Stampede! There's also a new take on funnel cakes with the additions of red velvet funnel cake and bacon sundae funnel cakes. Yes... bacon!! A jumbo sized one of course!! Next thing we came upon our meandering through Stampede grounds was the fried cheese! While not new, delicious melty ooey gooey bits of cheese with a light thin breadcrumb crust... how could I resist, especially when dunked into a tasty tomato-y sauce. Mmmm.. We got the jalapeno mozza sticks and the cheddar cubes. Nomnomnom!!! Mmmm.. savory and juicy, this jumbo turkey leg is smoked the day before (so don't go too late or they'll be sold out!) and tastes like a light ham with the applewood secret wood chip mixture they use to smoke the turkey. Served either dunked into their yummy tangy BBQ or have it on the side, its a messy delicious get all over your face yumminess! We met a nice couple visiting from Conneticut who soon abandoned their plastic utensils and dug into this hands on Carni-food! The same smoke house apparently makes a wicked pork item, but we were a bit too full to try that on top of the turkey leg! But go ahead, make your meat loving friends jealous with a pic of you biting into this gigantic turkey leg Fred Flintstone's style. Next up, got to try some deep fried macaroni and cheese which I couldn't find last year. A light and crisp bread crumb exterior hides, well macaroni! What makes these awesome is the creamy creamy creamy cheese sauce all ooey gooey molten inside these little golden triangles. These would be an instant fav amongst kids young and old! Nom! We eventually stopped trying to look for it and just asked folks who were noshing on some to find the stall for jalapeno corn dogs. The characteristic corndog batter is livened up a bit with some chopped jalapeno bits added in, which you can sort of see as faint green bits in the soft deep fried batter. My boyfriend really enjoyed it, but I'll be impressed if they add in melty cheese chunks into the same batter to really punch up..well, meat on a stick LOL! And what's stampede without some mini donuts? We were too lazy to walk to the other end of the fairgrounds for "those mini donuts" ($5 for 2 bags and they taste the best! ), so we headed to another mini donut stand. This mini donut stand sold them for $8 a bag, and wasn't as efficient, but we eventually got our mini donuts after a bit of a wait, with a pile of cinnamon sugar dumped on top and layered in between... Made for a bit of uneven sugariness - Those Mini donuts coats all the mini donuts by mixing them together in a bowl. Still, its the once a year treat - super soft, warm, melt in your mouth sugar rush.. and the donuts at the bottom of the bag were super cinnamony-sugar goodness! Mmmmm! Though we didn't get to try all the new foods this time around at Stampede, we'll try some of the stuff we missed in a few weeks at Edmonton's Capital Ex. 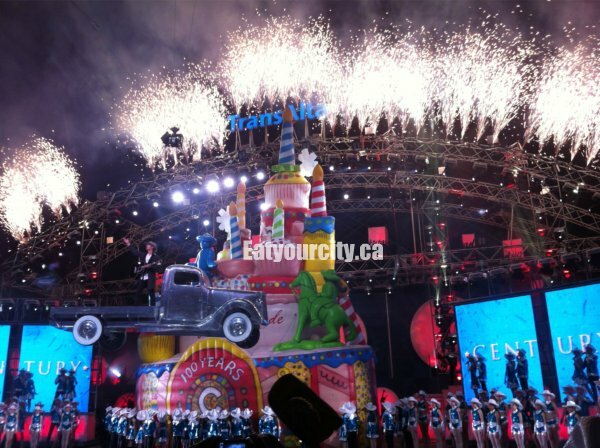 Happy birthday Calgary Stampede! Be sure to have a look at some of the food we at at last year's Stampede!